Not in so many words, of course. However, Briffa et al 2013 took a position on the use of radially deformed tree ring cores that would prohibit the use of strip bark bristlecones in temperature reconstructions, thereby emasculating Mann’s reconstructions. And not just the Mann reconstructions, but the majority of the IPCC reconstructions used by Briffa in AR4. I’ll report on this issue in today’s post. I’ve been looking closely at Briffa et al 2013 over the past 10 days and unsurprisingly there is issue after issue. According to CRU, they’ve been working on this article for over seven years and, needless to say, it is impossible to fully observe the pea in only a few days, especially when the adjustments have become so baroque that the chronology style is most aptly described as East Anglia Rococo, making the weary reader long for the classic simplicity of earlier CRU illusions like the Briffa Bodge and Hide the Decline. But more on this on another occasion. Even though Briffa was the AR4 Lead Author responsible for assessing recent reconstructions, Briffa has more or less steered clear of bristlecones and radial deformation. However, one of the objectives of Briffa et al 2013 was to try to dismiss or discount the high medieval values of the Polar Urals series (see tag “urals”) when the additional data of the Polar Urals “Update” was included. Previously Briffa had just ignored the inconsistency between Polar Urals and Yamal, pretending that the issue had never occurred to them. This obtuseness has long been criticized at CA, where reconciliation of such inconsistencies has been recommended as one of the highest priorities for specialists. The reanalysis of these data here show that the apparent evidence for high tree growth in medieval times in the Polar Urals region (circa 980-1040) was exaggerated due to inclusion of root-collar wood samples…We have shown here that that version of the Polar Urals TRW chronology (also combining larch and spruce data) is biased by the inclusion of multiple root-collar-derived sample data. As these root collar samples appear highly variable in terms of cross-sectional dimensions, rather than being generally symmetric, it is not appropriate simply to process them with a separate (root-collar) RCS curve and it was considered necessary to remove these samples from the Polar Urals TRW RCS chronology despite the already low chronology replication (see SM4 description and Fig. PC02). Passive voice exclusions and adjustments abound in B13 – a point that I will return to in another post. As an aside, the passive voice used to disappear the data reminds me of a famous phrase from the Vietnam War “It became necessary to destroy the town to save it” – a slogan that seems all too applicable to CRU’s approach to dendroclimatology. Closer examination of the details of the sample material reveals that the Polurula samples comprise a relatively large proportion of root-collar wood. The root-collar (or root crown) refers to the lower section of the tree bole (stem), generally near the soil surface, where the bole meets the upper parts of individual roots .. The root-collar samples have more variable (and generally larger) ring dimensions than regular stem samples, here sampled at varying levels above ground depending on the height of remnant tree boles. These concerns seem entirely reasonable to me. Inhomogeneity between sample populations are a very serious problem in Briffa’s RCS methodology. B13 asserts that need to test subpopulations for homogeneity, but are completely and irredeemably at sea in actually carrying out statistical tests for homogeneity – procedures on which many statistical specialists could have assisted. Nonetheless, their concern over inhomogeneity between root collar and stem samples seems valid to me based on my own first examination of the data. However, they are obtusely blind to other inhomogeneities of equal or larger magnitude. One wonders whether inhomogeneities between sites are in fact so severe as to swamp whatever Briffa is trying to do. An issue for another day. By bristlecone standards, the radial deformation evidenced in figure PU07 is very slight indeed. Indeed, it is doubtful whether a single bristlecone chronology can survive the implicit standards of Briffa et al 2013. The diagrams below show two examples (pages 32, 33) from Brunston of the extraordinary deformation in bristlecones – not even remotely “concentric”. The effect of scarring as a proximate cause of radial deformation was neatly illustrated in a graphic below (ironically from the thread on which the first notice of Climategate occurred). 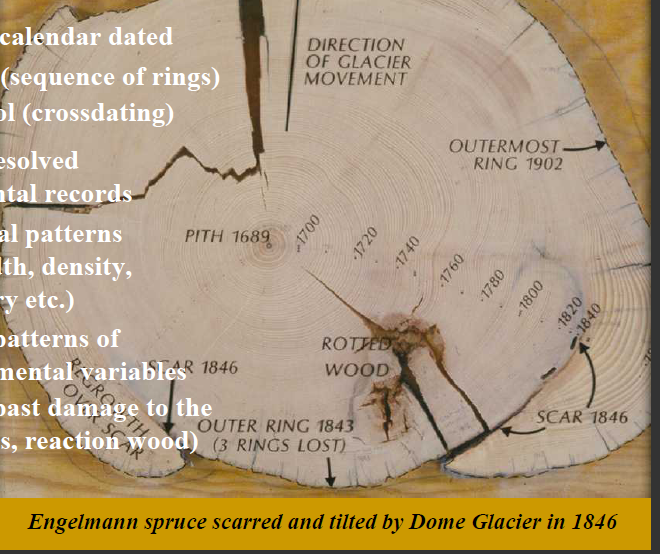 The cross section is from an Engelmann spruce which was scarred (see bottom of graphic) by a glacier. In areas adjacent to the scar (dated to 1846), there was a huge growth pulse (see bottom right part of tree). Variability around the circumference of this tree is far more extreme than that shown in Briffa’s PU07. In addition, the growth enhancement is much larger than in PU07. Figure 2. Deformation in engelmann spruce scarred by glacier in 1846. From presentation by Brian Luckman. See CA post ^. Figure 1. Ring widths in two 2007 cores in Almagre tree 31 (Graybill 56). The difference in widths is due to radial deformation. A further problem arises from the observation that radial increment may increase rather dramatically in the period after most of the bark dies back, but of course we don’t know when that was. At Almagre, Pete observed that strip bark formation could be connected to bark being torn off by falling limbs due to snow weight, a hypothesis that might connect the notoriously severe winters in the US west in the 1840s to the apparent bristlecone growth pulse commencing in the 1850s. As long ago as 2006, the NAS panel hadrecommended that strip bark data be “avoided” in temperature reconstructions, but this recommendation was flouted by Briffa in IPCC AR4 and subsequently by Mann (Mann et al 2008) and other specialists. Commenter Salamano at realclimate, in one of the earliest comments, asked whether the strip bark problem was comparable to the root collar problem, but unfortunately did not receive a reply that was responsive to the important issue. Nonetheless, it is an important issue. I very much welcome the strong position taken by Briffa and coauthors against the use of radially deformed tree ring data. I look forward to the prompt application of these standards by Mann and others to strip bark chronologies. Given realclimate’s endorsement of B13, I presume that realclimate will urge that all reconstructions relying on bristlecones be recalled pending assessment of radial deformation and inhomogeneity according to B13 standards. This entry was written by Stephen McIntyre, posted on Jun 16, 2013 at 3:26 PM, filed under Briffa, Multiproxy Studies, Uncategorized and tagged briffa, bristlecone, deformation, Mann, mechanical deformation, polar urals, radial deformation, urals. Bookmark the permalink. Follow any comments here with the RSS feed for this post. Both comments and trackbacks are currently closed. Steve, surely dada is a more apt theme…from Wikipedia; “Dada rejected reason and logic, prizing nonsense, irrationality and intuition”. Fits the bill perfectly! LOL. Hope you’re not holding your breath, Steve. They’ve treed up the wrong bark! “Here in Ireland we once drove round Ireland jumping over walls and coring stands of ten trees wherever we could find them. That was in 1979, when we were young and irresponsible; there just never seems to have been a day free since then, because, of course, it isn’t a day you are talking about. It is the ‘getting permission’, the ‘collecting’ and the ‘processing’ of the samples from say six or eight sites on our small island – a month’s work maybe? Maybe two? (We also collected a series of English and Scottish chronologies around 1980. Re-building those would make it up to six months, maybe a year of work!) It is just enough work to stop it getting done on a whim. So in the 1990s we tried asking grant giving bodies to fund us. Such work is not regarded as ‘cutting edge’ so it doesn’t get funded. Note that if it had been funded in 1995 it would need doing again now! People working in universities in this country (UK at least) are now “busy to within an inch of their lives” doing administration and trying to keep weak students in the Thatcher/Blair-revisited system while doing cutting edge research. There is no longer time for doing stuff on whims, least of all stuff that is poorly regarded by research councils. You also need to know that very comprehensive suites of high latitude/high altitude tree-ring chronologies (from essentially hundreds of sites) were produced across northern Eurasia and Canada/Western America by one (almost lone) Swiss wood-man, namely Fritz Schweingruber, back in the 1970s and 1980s. The records are world class but they all end pre-1990. The effort was super-human at the time. To do it all again now…essentially impossible! I often wonder just what the trees are now recording. so Fritz Schweingruber did’nt know his “root-collar” from the “trunk” in his wood samples? So Briffa goes for the nuclear option to get out of a tough spot with the Yamal/Polar Urals problem. It’s interesting to speculate whether he and his coauthors were aware of what they were doing. By proscribing the use of tree rings with known radial deformation, albeit “root-collar” in this case versus “stripbark” in the case of bristlecones, but to the same effect, they have issued an after-the-fact condemnation of just about all the multiproxy reconstructions relied upon hitherto by the Team/IPCC. So: did they know this was what they were doing but went ahead out of a sense of genuine conviction, or does this implication take them by surprise? It’s a simple test. If the former, in other words if they believe the grounds on which they have dismissed the Polar Urals chronology, then we will see a series of retractions and critiques of all the studies that depend on radially-deformed bristlecone pine series. If the latter, i.e. if connection takes them by surprise, then they are pretty slow-witted. The other option is that they simply hoped nobody would notice. That would fit the larger pattern–a science whose public reputation depends on nobody looking too closely at what they do. Steve: It is indeed a nuclear option. Once the issue of inhomogeneity is fully engaged, it’s hard to see what can be salvaged. I don’t think that Briffa or his coauthors have the remotest understanding of the statistical issues arising with random effects. I suspect that Briffa only had is eye on purported carbon dioxide fertilization in connection with bristlecones, since that’s been the main issue within the field. And that Briffa too readily accepted Mann’s bristlecone “defence” that he already “adjusted” for it. Of course, none of this helps him as against mechanical deformation of strip bark trees. 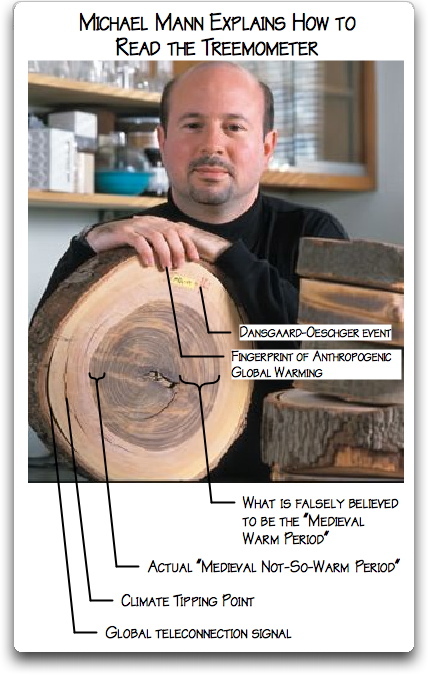 I look for Rob Wilson to pen the critical review setting the field of tree ring proxy-thermometry to rights. The timing of this paper is also convenient. It is after the deadline for AR5 so the IPCC will not need to mention concerns about Bristlecones in the next report. Guess we can assume Mikey won’t have Keith on his Christmas card list from now on. I don’t understand some of Professor Briffa’s logic. I can see why greater care should be taken when drawing conclusions from “root collar” wood samples. However, I don’t see why that concern would necessarily be correlated to a “temprature signal” in the medieval time period. I understand that older samples would likely be more affected by rot and that wood from the midieval period would be more likely in that group. But wouldn’t the “root collar” radial deformation issue standing alone be as likely to cause an underestimation of the “medieval temp signal” as an over-estimation? On the other hand, the “strip bark” deformation issue would be correlated to the time period following the bad winters of the 1840s. Also, it has always seemed to me that the “strip bark” deformation itself produces an attractive sampling location. All things being equal, wouldn’t one tend to focus one’s concerns on the BCP data? Steve said:It is indeed a nuclear option. Once the issue of inhomogeneity is fully engaged, it’s hard to see what can be salvaged. I have never understood how one core, which likely doesn’t exactly hit the heart center, was supposed to represent the information contained in the pattern of the rings of even your average tree. As you show in your example above, there’s a whole complex story of glaciers and all the rest in the tree. What would a core show about that? Even trees that are not stripbark or mechanically damaged, like the one Dr. Mann is holding in the picture below, give a totally different view of history depending on where they might be cored. I did the image as a joke a few years back, but with a serious purpose. Look at the difference in width between what I call the “Medieval Warm Period” and the “Medieval Not-So-Warm Period” in the image. Those are the same tree rings, just sampled on opposite sides of the tree … so was it warm, or cold? Willis, suppose we took that horizontal slice of tree trunk that you have pictured there and divided it into 36 radial pie sections. Suppose we then measured the average width of each tree ring within each of those 36 pie sections. For any individual tree ring which totally circumscribes the tree, how much variation in average width do you suppose we might find among those 36 sections? How would the distribution of average ring widths change as one moved from the heart of the tree outwards towards the bark? Now for the $64,000 question ….. has this kind of analysis already been done for those tree species which are now being used as temperature proxies in paleoclimate reconstructions? And if this kind of analysis hasn’t been done, should it be done? Who in their right mind would use root collar samples? Who would even stoop that low (pun intended) that such a part of the tree would even be CONSIDERED? Oh? The stem of the trunk was rotted on many of them? What? Like there weren’t other freaking trees to sample? In the Taimyr Peninsula? Duh. After seeing the cross-sections of the bristlecones, anyone using them must be scientifically challenged, if not cerebrally. And this is just coming out NOW? It buggers the imagination, doesn’t it? [Steve Mc: issues with strip bark bristlecones have been a longstanding theme at this site. The problems have long been known to specialists, including MBH coauthor Hughes, and prior to Mann et al 1998, they had not been used in reconstructions. Indeed, the introduction of strip bark into reconstructions was arguably the greatest innovation of Mann et al 1998. However, once introduced, paleoclimatologists quickly got addicted to the convenience of having a dramatic HS in their networks and strip bark chronologies were used in nearly all AR4 reconstructions. I’ve used the term “heroin for paleoclimatologists” in the past – a comparison that offends climate scientists. Since AR4, there has been an effort to diversify the reconstructions and some new proxies have been introduced. In the process however, other issues have arisen e.g. contaminated lake sediments. I can’t recall the paper, but one argued that trees older than about 1550 CE were really unreliable. In general that would make any MWP trees and 1,000 year-old trees a bit dicey if correct. Dicey/iffy proxies – it is frankly amazing that any proxy whatsoever can be used without having been seriously vetted over time. And if proxies are used in a frontier science way, the authors I would require to spell out to anyone reading the paper that the proxy is new and may be uncertain. All that only sounds like prudence and doing due diligence to me. To have Briffa come along over a decade later – the decade of runaway warmism alarmism (“walarmism”?) – and ‘out’ this is really amazing. Someone on the thread here pointed out that the latest tree ring field work ended a good bit ago and how unlikely it was that funding for anymore is going to happen. With all the billions going into AGW studies, if that is true, then that lack of funding is beyond ridiculous. Thanks for mentioning ice cores. Have you ever done any work on flows in plastic materials? I have. And you bringing this up makes me smack my forehead that I hadn’t thought of it before. In all of this, across that gradient, what you have is laminar shearing, where the mismatched speeds of each “ring,” or zone, slides against the ones on either side of it. As it applies to ice sheets that flow, we often hear about how the base of the ice sometimes flows fast, due to free water (as I remember). But that is for more or less smooth terrain. When the terrain is rough, there is “mechanical” locking up, very much like a geological fault line where the rocks lock together until the force gets so great the fault “slips”, causing an earthquake. So, though there are places where the basal flow is rapid, there are many places where it is not, or where it hardly moves at all. Yet the ice does keep moving. And the part away from the terrain (the top) is much more free to advance. And what effect does this shearing have on the air bubbles that get analyzed? We are led to believe that the ice just sat there getting compacted nicely and then sitting there for millennia. Guys, I am here to tell you: That most likely didn’t happen – and they would not be capable of telling the difference. All they have is that column of what they perceive is static ice. All those visible layers may even be representative of the shearing I am talking about. The lateral shearing must be HUGE in ice sheets. It is even possible that there was enough shearing to melt the ice at any point in time – perhaps several times. “shear zones” are common in geological formations association with gold mineralization. While I do not claim to be expert or even proficient on shearing phenomena, it is on my radar. Thanks, Steve. Yeah, I was not doing this as anything trivial. If they cover it, fine. I have yet to see anything addressing shearing, and I’ve read a few papers over the last decade. I could have missed it. If it remains unaddressed it’s a shocker. It would be good to see a paper that solely delineates shearing as it affects cores. Steve: an OT question. were these lava flows komatiitic? Also somewhat OT- in an old thread, I noted that the contact between sagebrush and bristlecone growth in one California site closely followed the geological contact at the dolomite – another case where vegetation and geology follow one another. … were these lava flows komatiitic? WRT ice. I have been thinking about the behavior of it. We know that glaciers crack. People from time to time fall into the large ones. If there are large ones, then there are probably many more smaller ones throughout the volume of the ice. I forget what the law is called, but usually there are more cracks the smaller the scale. We all know that ice can “heal” its cracks under pressure. As cracks come and go, CO2 would be redistributed, but the layering could be preserved. The net effect, however, would be to smooth the higher frequency CO2 signal, as a gas could move in the crack. Water frozen in the ice would not be redistributed nearly as much. The possibility of CO2 diffusion in solid ice has been rejected as a smoothing mechanism in deeper ice, but cracks could still effect smoothing. This effect would be able to act over thousands of years, and one would expect the deeper and older the ice, the more smoothing from this effect. So: did they know this was what they were doing but went ahead out of a sense of genuine conviction, or does this implication take them by surprise? It’s a simple test. If the former, in other words if they believe the grounds on which they have dismissed the Polar Urals chronology, then we will see a series of retractions and critiques of all the studies that depend on radially-deformed bristlecone pine series. If the latter, i.e. if connection takes them by surprise, then they are pretty slow-witted. The other option is that they simply hoped nobody would notice. Ross, I always had the impression that Briffa and Mann et al never cored a tree in their lives, that they were just (bad) number crunchers. This one I might want to put primarily on Schweigruber or Hentamirov or whoever took the samples. But I wouldn’t give Briffa or Mann or Jones a pass – because they have a responsibility to vet the methodology of those out in the field. If all they did was take the numbers and compile them without critcal sconsideration of such things as Briffa is now addressing, hey, this tells us that the data may not be worth a pack of chewing gum. And maybe it is. But if one can’t tell the difference, what level of confidence can one have in the data? Not calling Briffa a liar, but this is quite a bit l like a liar in court – once someone has been seen to lie, nothing he says will ever be believed in court again. In this case it is the data, the samples. Note on Willis’ captioned photo: Man! (pun) That tree that Mann is showing – why would the dodo use such an asymmetrical trunk slice for a posed photo? Like WIllis says – which core tells what story? And it is all the same freaking tree. Is there a tree out there that doesn’t tell several stories? And which one do we listen to? And who can tell when coring one whether they have a symmetrical tree trunk or not? [snip – over editorializing] Dendroclimatology has a BIG problem here. Steve Mc: Earlier in his career, Briffa cored some sites in Scandinavia. It is my impression that neither he nor Osborn have ever been to Polar Urals or Yamal. I was thinking about this because there isn’t any proper site map in B13 of the Polar Urals site, showing, for example, the sampling locations. Had they been to the site, they would have been more interested in this. The lack of any trip in the Climategate dossier supports this impression. Geologists aren’t allowed to write qualifying reports without visiting a site. So it’s a little surprising that dendros can write peer-reviewed reports about a site without ever having been there. Thanks. It’s good to know that Keith has been out in the field. Your last point is a seriously good one. I am also heavy into the Younger Dryas Impact Hypothesis, and in that also controversial subject, I haven’t seen a paper whose authors didn’t include at least two field researchers. Yes, Briffas has Schweingruber and Shiyatov on this one, so I’d personally say they have it covered. That sound like religion to me…. Steve: I’m sticking with Rococo. This stuff is very frustrating when you look closely at it, but it’s exaggeration to describe it as a rejection of reason and logic. The trouble with exaggeration is that it creates straw men and people like realclimate much prefer responding to exaggerated straw men and avoiding more nuanced criticism. That crossed my mind as well. If everyone just grabs a bit of core from random parts of trees, and compares them against each other, it is reminiscent of the story of the blind men and the elephant. Well, this is pretty amusing. Take aim at the rat of MWP and blow out a whole side of the hull. Isn’t selecting trees based on any aspect of their rings a form of “selection on the dependent variable” and likely to lead spurious results? Is it possible that root collars are telling us something about the use of tree rings for temperature reconstructions, and that with their exclusions that information has been lost? For example, are root collars telling us that tree rings are not reliable global thermometers, because the width of the rings varies widely depending upon the how quickly different portions of the trees rot, which affects the randomness of the sampling, which skews the results? Isn’t the whole field of study of tree rings full of examples of “selection on the dependent variable”, where different tree populations are excluded because they are thought to not reflect temperature? Aren’t these other trees also telling you that tree rings are not reliable global thermometers? The problem with selecting cases for study on the dependent variable stems from the logic of explanation. When one sets out to explain why countries A and B have, say, developed more rapidly than countries C through G, one is implicitly looking for some antecedent factors X through Z that countries A and B possess, but that countries C through G do not. The crux of the difficulty that arises when cases are selected on the dependent variable is that if one studies only countries A and B, one can collect only half the information needed, namely what A and B have in common. Unless one also studies countries C through G (or a sample of them) to make sure they lack factors X through Z, one cannot know whether or not the factors identified are crucial antecedents of the outcome under investigation. Countries A and B may be the only countries that have X through Z, in which case the hypothesis seems plausible. But many other countries may also have them, in which case the hypothesis would seem dubious. All of this still fails to address the issue , that when you get down to it there are far many issues that may effect tree growth, many poorly understood ,other then temperature for these rings to be used as indicators of past temperature to any decent degree of accuracy. I am going to take an editorial line against generalized complaining and editorializing against dendro. These themes are familiar to CA readers. I will delete any more such generalized complaining. I remind readers that editorial policies here (though inconsistently administered due to lack of time and energy) prohibit generalized complaining as this is very annoying to third party readers. There are other blogs where you can complain as much as you want if you feel the need. In this post, I am not making a generalized complaint, but attempting to show that consistent application of a standard set out in B13 would have far reaching effects within the field. Please connect any commentary to the specifics of the post. Steve: your comment perhaps applies somewhat to US southwest dendro, but Polar Urals trees were studied because of interest in forestry and climate over time. In the past, you have argued for including all the data. Shouldn’t mechanical defects even out in the long run, if you have enough data-points? Steve: I have never attempted to set out simplistic rules for data analysis. I have strongly argued against ex post screening. But I’ve never suggested that inclusion of contaminated data is mandatory e.g. the Korttajarvi sediments. In addition, I have consistently emphasized the problems of six-sigma data in small datasets. “in the long run” has no meaning in such situations. So the problem with “radial deformation” is that growth rings expand for reasons other than warm-weather growing seasons? In that case, particularly in “mechanical” instances of glacial pushover and so forth, such rings should show asymmetrical, rather elliptical profiles, compensating expansion on one side with contraction on another. Why not measure deformation on a dual-foci basis, deriving this skew-factor as an eccentricity function that serves to indicate the degree of deformation in context of a growth-ring’s major axis? Though Phil Jone would have a problem with the elementary math, not to mention spreadsheet strings, this technique would seem more objectively apropos than dendros’ conventional ad directio (“moving target”) compilations. Yes, trees do grow for other reasons, with precipitation being the main other factor. The really odd thing is that botanists use tree rings as proxies for precipitation. Obviously tree rings cannot be proxies for both, because no one can (presently) know how much of each factor created how much growth. So extracting the temperature component seems iffy at best. Please excuse me if this is impertinent, but could a brief spike in CO2 concentration also affect the growth of trees, a spike so transient that it would not be registered in any other proxy record? STEVE: seems very very implausible. It is always good advice to tell the truth because then you don’t have to remember what you told to people. The same applies to ad hoc hypotheses to “save” your results. When different people make ad hoc arbitrary decisions (exclude or include these trees, weight these trees heavily, pretend precipitation is constant over time, use root collar or not) contradictions are impossible to avoid. The failure to recognize contradictions by the dendros and deal with them when outsiders can clearly see them only leads to loss of credibility. But credibility is the essence of science. Sorry, guys, there is no way around this. snip – I asked people not to editorialize against dendro. Like doing the Limbo under a Zamboni. Perhaps Craig, but it is a lot easier to get statistical significance if you pick samples that have a particular quality you look for. Making post hoc into a prior is obviously central to the field. Reading article (and others) makes me think that Briffa, Mann etc. not only failed to take the advice of real statisticians, they also forgot to ask plant physiologists about tree growth and responses to stress. would have been a good starter. I wonder how this will affect work at UEA, or indeed almost everything at the Met Office. Does this mean that the special case of strip bark bulges can be satisfactorily accounted for provided there are both root and trunk samples for a given tree? Why does Osborn believe the Khadyta River data does not significantly change the results, while you do? Presumably you both should be on the same page with regard to this point? Steve: you have to read between-the-lines with Osborn since, like Gavin Schmidt, his responses are frequently misdirections. Osborn has completely evaded the issue of strip bark bristlecones, which have extreme radial asymmetry. I very much doubt that taking root and stem samples from bristlecones would help in the slightest. In any event, such pairs have never been used in the IPCC reconstructions and the utility of such pairings would need to be established by detailed analysis. Khadyta River is an issue that I’ve not written on in detail yet. Schweingruber took many samples in Siberia and the Khadtya River chronology is very similar to other Schweingruber chronologies in the area. Briffa et al 1998 (which reported the Decline) used these chronologies. B13 now says that “Data from one site (Khadyta River, KHAD) appear anomalous with respect to the majority of site curves”. Osborn made similar claims at realclimate. While Khadyta River results do not show the high recent growth at the YAD sites (and nearby), the results are almost identical to the HDT results retained by B13. There is a definite contrast between results in different areas. By populating one area and depopulating another, results can change. CRU makes many selection decisions and these affect results. “Why does Osborn believe the Khadyta River data does not significantly change the results, while you do? Presumably you both should be on the same page with regard to this point?” I am confused here: Is the “you” in these sentences referring to Briffa or to McIntyre? Please explain. From what I’ve been seeing, Steve has been showing graphics that depict the greater Polar Urals regional chronology delivering a much different message regarding temperature. Osborn has stated that if they included the Khadtya data set in their results it still wouldn’t change things significantly. I do not think both statements can be true. Steve: In their newest iteration, they’ve added more cores from the YAD area where 20th century growth has been higher. I’ll get to this – they’ve been working on this for years and it takes time to figure out the moving parts. Right now I’m more focused on Polar Urals. The age structure is certainly different but in reality the main difference comes from the sampling. Amazing, same problem for MXD of polar.raw with series extending after 1990. New samples are denser and have more variability. The stall occurs in the latter half of the seventeenth century. Without thoses new series, the MWP is clearly visible. Steve: CRU simply don’t have a clue how to carry out a statistical analysis. BTW the post-1990 samples (purlasi and purlasi_sc) are located at lower elevations (185 m) than the Schweingruber samples (250 m). The subfossil samples seem to have been taken at even higher elevations (280-340 m) – above present treeline. So there’s a major inhomogeneity that CRU has ignored. It’s probably impossible to fully sort things out with the present record – no proper location maps, no proper archive of metadata. It looks like Shiyatov kept organized metadata, but unfortunately this hasn’t been reported. Instead we only get the material through the perspective of CRU authors, who do not have a clue when it comes to reporting coherent metadata. It would be great if Shiyatov published a detailed report without involving CRU. What is also surprising is that Briffa et al. use the RCS method for MXD while there is no detectable sensitivity to age, it’s pointless. A proper method for MXD is normalization because it can effectively adress the inhomogeneities. “Did work”? “Such an approach”? Wow, so that sounds like they made up a protocol ad hoc, on the fly. Wow. That sort of thing needs massive vetting and transparency. This seems to be a common fault of the Hockey Team – inventing new ways on the fly (sometimes when other protocols are out there already). Steve: Yup. It also seems to me that they are making up protocols on the fly. Something that we’ve seen before. Even after the fact, it’s hard to tell what the protocol was. The medieval roots were an unadjustable inhomogeneity, but the purlasi_sc data was an adjustable homogeneity. They also have protocols for separately adjusting “fast growing” and “slow growing” trees as though there is a bifurcated distribution. But no hint as far as I can tell on how this split is implemented. Someone more literary than I can replace the original with the corresponding paleoclimatological. Alas palm trees, being monocots, produce no growth rings. I was going to mention this too, but I managed to keep a lid on my pedantry. I thought Steve’s joke was rather good. Count the coconuts and then: Play Ball! Re: Karl W. Braun (Jun 18 03:21), Alas palm trees, being monocots, produce no growth rings. As if that would matter — If there is data use it! appears to be the motto! Aren’t there any standards for collecting cores from living trees, like three cores, one facing North and two others at 120 degrees respectively? And for dead trees, an entire cross section? Then we could derive the data needed for a reconstruction. I have seen the bristle cones in Nevada and wondered how anyone could get a representative sample. These are trees that have gone through hell and lived to tell the tale, just barely. Steve: Without over-editorializing, one can say their radial asymmetry is definitely much much greater than the Polar Urals trees, which Briffa rejected. Shiyatov, one of the B13 coauthors, has done careful work in the Polar Urals and criticisms of CRU articles cannot be extended to work in which Shiyatov is lead author. Shiyatov has been working for a long time and seems to be a very old-school forester – perhaps like Mauri Timonen in Finland. Shiyatov’s collection of subfossil crossections at Polar Urals is far more extensive than that considered in B13. Shiyatov says here http://cdn.intechweb.org/pdfs/19851.pdf that they have collected 2262 cross sections of subfossil trees up to 2004. The link and other recent Shiyatov articles show methodical collection of information. Although B13 purports to provide a short history of collection efforts at the site, they made no mention of the extensive Shiyatov program. However, CRU restricts their consideration of subfossil crossections to the subset of data forwarded to Schweingruber in the 1990s – data that was collected from 1977 to 1983. It is very odd. The data ,with help, gives them what they want . It is not ‘odd ‘ its normal climate ‘science; practice . Wind is a major factor that can distort the pattern of tree rings, especially in marginal conditions between two environments. Peter Scott grappled with this problem in tree ring studies done at the tree line at Churchill, Manitoba in the late 1980s and early 1990s. It is also possible that persistent katabatic flow near a glacier would cause similar distortions of growth patterns. Scott did sampling on all four quadrants at regular intervals up the tree in an attempt to offset the problems. I have built furniture out of wind damaged heart pine. It produces an interesting grain, wholly different in appearance from the usual. Entering “Influences of wind and snow on treeline environments” into http://www.duckduckgo.com returns a link to the paper as the first search result. – the file “alpine_tundra.pdf” on the BC government’s web site, titled “Alpine Tundra Flora” has a dramatic photo of a tree abused by wind and snow, and some comments on growth. The first ten pages have information on trees, plus the last page lists growing in clumps as an adaptation by trees, the rest of the document is about “alpine tundra” above the tree line. Page 10 makes a claim about lower tree lines in moist maritime environments. Appears to be from a paper or book by “Körner, Ch”. I have not studied any of them to significant degree. way too muxh piling on…..do you want someone to answer all your indignant questions or are you just a bunch of stupid rednecks? Weird. I just assumed Steve McIntyre was making a Proust reference above, and now I see that you have an even more direct one in your linked web site, “man in a barrel ~ Remembrance of things seen“. So would it be a fair summary of this post that Briffa is The Man Who Proved Too Much? I’ve often commented on Briffa’s propensity for mentioning paper-killing points in the center of his articles and then moving on as though the car accident didn’t occur. From the CG emials, I think his relationship with Cook has had a great influence on his bluntness. It is interesting to see him acknowledge in print, what should be field-changing problems mentioned so many times here. Perhaps he reads CA more often than he admits. With all developing techniques, there comes a point where the technique is rejected or allowed to proceed. I’m arguing that although dendrochronology should be given a pass, dendroclimatology does not have the required ingredients to proceed. snip – sorry about that, but I asked people not to editorialize about dendro and to restrict comments to specifics. Very simple statistics are sufficient to highlight the great interest of dendroclimatology, especially for ring densities. The problem is not, or mainly not, at the technical level but rather at the level of psychological biases. Steve – Point taken, but I was trying to ask if there remained some specific statistical methods, not yet applied to dendroclimatology, that needed to be tried for completion. I’m uncertain, but you have dug deeper. Geoff. Why are oak and yew trees not used in the UK for climate research? Oak trees can be found 500 years old and a few yew are meant to be over 1000 years. Steve: sorry about the snip. To give a short reply, oak trees have been extensively researched by UK specialists. If you are unfamiliar with a topic, I’d urge you to be less categorical in your assertions. snip – too much OT editorializing. Stephen, I gave examples of traps and being careful, why do you object? Regarding CO2 fertilization effects Jim Bouldin at Realclimate points http://www.realclimate.org/index.php/archives/2013/06/yamal-and-polar-urals-a-research-update/comment-page-2/#comment-363679 at a study that says that increase in tree-ring width in subalpine Pinus cembra from the central Alps that may be CO2-related. See http://link.springer.com/article/10.1007/BF00195270 Jim doesn´t like the steady and significant increase of mean ring width for the considered age class from approximately 1 mm per year in the middle of the last century to about 1.4 mm per year at present but is happy that the authors come up with many other possible explanations. To clarify a bit, I don’t really care one way or the other about the trend in ring widths over time in those trees. What I liked was the way the authors attempted to conduct a “natural experiment” by looking at the ring data in such a way that inferences regarding the relative effects of CO2 fertilization, versus climatic effects, were possible, which they otherwise would not be. In fact, I care very little about the specific results of any study until I know exactly how they were arrived at. As I’ve mentioned in one of my pieces, I am very high on the idea of natural experiments, which when dealing with strictly observational (i.e. non-experimental) data, I think is without question one of the most essential tools in the toolkit. Sometimes the only useful tool I would say. There is, in my opinion, a way to escape from this problem. From 150 years, the age effect becomes negligible allowing do without RCS method in so far as we does not take into account the young rings. We can then apply normalization. If we limit to a relatively short period, it becomes even easier and more reliable. Unlike MXD, the result is not comparable to temperature, but at least it’s probably very close to a climate signal because selection biases are removed. Steve: in practice, most age curves flatten out fairly quickly. IMO the main difficulty in the field is inhomogeneity between sites and between subfossil/living sampling, rather than age-curve fitting. phi, you’re on the right track there but I need to make the following point, one I made in my manuscript but which was not understood by the reviewers. We need to separate the age/size effect into two distinct components which arise from two different sources. This effect has typically been referred to in the literature as the “biological” effect. The first component is purely geometric and is the one you refer to; ring widths must decline as 1/(x^2) were x is the stem cross sectional area. If that were the only component of the biological effect, then yes we could just truncate each core by removing the first x number of rings (less than 150 even because the effect is extreme at first but then decreases rapidly). But an even better solution would be to simply convert ring width to ring area (= BAI, basal area increment, standard use in the forestry literature), completely eliminating this geometric effect. Unfortunately, there is a second effect that we can have no such simple, analytical solution for–and it is a *truly* biological effect in the literal sense of that term. That is, the tree may very well be–almost certainly is in fact–altering it’s internal allocation of carbohydrate to stem radial growth over time. And for that there is no easy solution or theoretical approach developed. Very interesting. I just have one question. Briffa RCS curve (which I also reproduced) is purely empirical. Given the orders of magnitude, don’t you think that we can still conclude that the overall effect of age becomes negligible from about 150 years with respect to other sources of error? Indeed, in any case, this is what could suggest the comparison of the three curves. I think you’re onto something important, but no, I don’t think we can conclude that apriori, although I’m not sure if you’re referring to Briffa etal 2013 specifically, or rather asking a more general analytic/epistemic question. It might be +/- true in particular cases, and it also might not be, and we need some way of assessing that likelihood. I’ve done some extensive some work on exactly that; it involves looking at variation in growth as a function of age/size within individual years, not across years, thereby removing the potential effect of environmental change. Another point to remember is that removing the early rings can cause serious sample size issues when you estimate the chronology. Take the Siberian larch used in this study at Yamal for example. A large fraction of the sub-fossil trees were in the the 80-140 year age class. Let’s say we remove just the first 50 rings of each tree–what does that do to our yearly sample sizes? It drastically curtails them, increasing the likelihood of sampling error. Thank you for your reply. I thought specifically to Briffa 2013 (and even more specifically to the twentieth century) but obviously with a possibility to generalize. I am well aware of the problem of reducing the amount of data, but, in this particular case, the excellent high-frequency correlation seems to demonstrate that there is not much lost. phi, yes agreed–if you had high enough and stable enough inter-tree correlations over time, *and* solid evidence that the age/size effect was minimal after a defined point, then you could conceivably do what you have in mind, depending on how “enough” is defined. And we can explore exactly those questions via simulation modeling. That’s why I said you were onto something important. Has Briffa or Mann responded to you in private about the content of this blog? Steve: Does B13 back away from the MXD use? The best data, says Briffa, comes from analysing both ring width and the maximum density of wood in each ring. By firing X-rays through the wood, researchers can now analyse the density of rings as little as 30 microns across — the equivalent of a tree’s girth growing by a centimetre every century. The growth of cell walls late in the growing season creates the densest wood and, says Briffa, “appears to depend directly on the average mean temperature”. Even so, ring growth is a product of many factors, including the genetics of the tree, past climate, the age of the tree and soil moisture. The relationships between ring growth and summer temperature are not a precise. But comparisons between the recent rings and known climatic data show that the rings can capture at least half of the summer temperature variability. The temperature graphs produced at Tornetrask show “pronounced variability on all timescales, from year-on-year variations right up to century-on-century,” says Briffa. On the longer timescales, for instance, they show 20 major cooling periods during the past two millenia, including long spells between 500 and 850, between 1100 and 1350 and between 1580 and 1750, the little ice age. There were also long warm spells between 900 and 1100, known as the medieval warm period, and 1360 to 1560. [ed: show graph from NERC paper]. Reply to a comment by Jim Bouldin in another thread. That is not quite correct. It may not be critical from your your view, but it it serious sub-optimal to estimate the growth component in a sequential fashion. 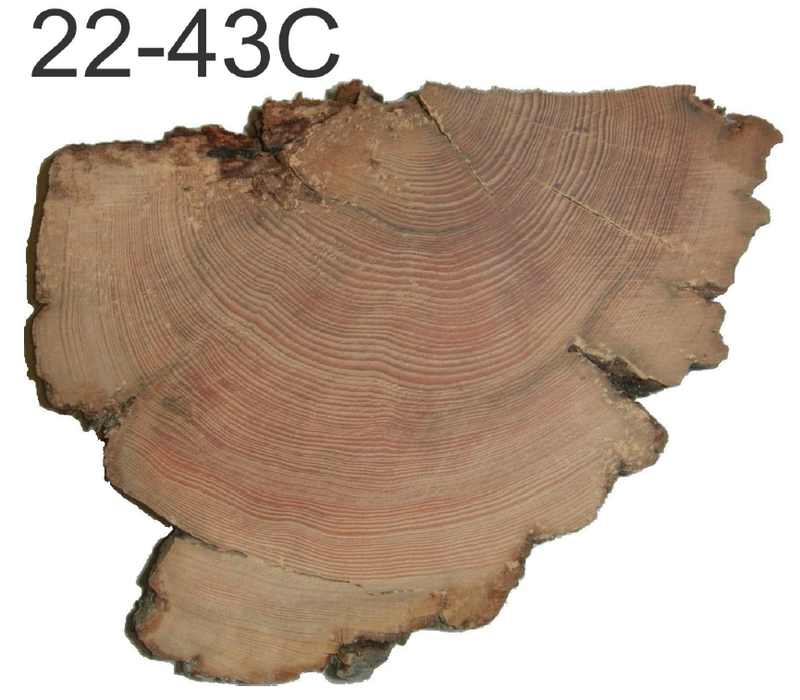 Each tree ring contains effects due to the age of the tree at the time, the “climate signal” and the effects of other factors which may affect the growth for that specific tree. Due to the structure of the data (in particular, the imbalance of the distribution of numbers of trees of various ages over time), estimates of the growth component as a first step will be confounded with the information from other factors in the situation. Correcting for this problem with techniques such as spline smoothing does not take those other factors into account and will usually provide at best a suboptimal improvement. Simultaneous estimation of all of the factor parameters is capable of minimizing this effect because all of the factors can play a role in the estimation of the each of the other factor effects. This will also make it much easier to get proper uncertainties for the parameter estimates in the model as well. Roman, like you, I’ve experimented with this problem. It is easy to implement simultaneous estimation in the lmer package. The resulting “chronology” is conceptually a little different from the standard dendro recipe, but IMO leads to a statistically more interesting route than the conventional dendro recipe. In benchmark cases, the chronologies from different approaches “look” similar tho nuances differ. I agree with you that it’s an issue that should be of interest in the dendro community even if the differences do not appear to “matter” at first sight. A further advantage of the lmer approach is that I’m pretty sure that it could be adapted to give diagnostics for inter-site homogeneity, the issue that ought to have been of primary concern to Briffa et al 2013, which, instead, fell into the unintelligible comparison of squiggles that passes for science at CRU. This is one of the first positive discussions on methodology I have seen. I hope that Dr Bouldin keeps participating but it does depecnd, I believe, on character-sniping being kept to a mimimum. I would also be sorry if Dr B were to be excluded from his role at RealClimate simply for showing signs of real scepticism about existing approaches to recovering temperature data from tree-rings. His posts have broughts the matter alive in a way that few others have managed. This is a bit of a nonsequitur with respect to Jim’s argument IMO. If you calculate the age model independently as a first step, all the other stuff is noise and can at least theoretically be filtered out with a large enough population. I don’t know enough statistics to know what is wrong with that approach. But Jim’s argument is different. He is saying that if the age distribution is skewed in the population, then the age model will be inherently skewed, not skewed by noise from confounding factors. That would be great Roman, if it’s feasible, and I know Steve is high on nonlinear mixed effects modeling as a possible solution to the problem (and somebody at Ameridendro presented on that last month also). I don’t see it, given the highly confounded nature of the problem, but that’s only because I’m not familiar enough with mixed effets modeling. One thing I do know: whatever solution is proposed has to be tested under simulation or we’re in the same boat we’re in now with an unvalidated method. The legal status is simply that Mann’s suit can go forward in September. It would be a shame if anyone at NR or CEI stopped defending Steyn simply because the issues were not well enough understood. Skiphil, as ar as I’m aware, those “investigations” have never been examined in these court proceedings. If the defendants have called those “investigations” into question, the judge behaved inappropriately by effectively dismissing the concerns. If the defendants have not, they’ve missed a key point in the case. Someone has done a poor job on this issue. It’s especially bad since the judge claims the Mann’s work has been “proven as accurate.” This is a gross characterization of the “investigations” as none of them investigated the scientific underpinnings of Mann’s work. 16 Here the Court notes Defendants’ argument that the various investigations have not been thorough, fair or complete. If the Court acknowledges the Defendants have called the investigations into question, it cannot justify saying those investigations have proven anything as accurate. Doing so effectively dismisses the Defendants’ argument. This is especially true given the ruling’s discussion of the investigations. It devotes one paragraph to the Penn State investigation, then in the very next paragraph says “the National Science Foundation… found that ‘Penn State did not adequately review the allegation in its inquiry, especially in light of its failure to interview critics of [Plaintiff’s] work. '” Clearly, the Penn State investigation cannot be used to justify anything at this point. That’s it. That’s the entire basis offered in this ruling for it repeatedly claiming investigations have proven Mann’s work is accurate. The entirety of the support the judge offers for the Court’s decision is a single sentence that in no way supports the language used by the ruling. That strikes me as crazy. I don’t think it should be okay for judges to hand-wavingly make claims about evidence when making their rulings. But maybe that’s just me. I sure hope so. Otherwise this judge is disgracing her position. The judge flat out stated investigations proved things. The Defendants have called those investigations into question, and their claims have not been resolved. By stating the results of those investigations as fact, the judge dismisses the Defendant’s responses to them without examination. That then is used as the basis for upholding Mann’s suit by extremely narrow margins. In other words, the judge appears to have upheld the suit by simply saying the Plaintiff is right on an issue without even considering the Defendants’ response. There might be filings or evidence that contradicts this depiction, but if not, I think this ruling is absurd. Are all the filings available online? At this stage, the evidence is slight as to whether there was actual malice. Anyway, the fact “evidence was not taken on the investigations at this stage” is exactly why the judge shouldn’t have drawn conclusions about those investigations. It’d be fine for her to refer to them. It’d be fine for her to discuss the hypothetical significance of their results. It isn’t fine for her to state their findings as fact in a way which rejects the concerns raised by the defendants. Doing so effectively says the defendants are wrong before they’re even allowed to make their case. Although Mann rowed back (and deleted the tweet Skiphil quotes) on Wilson being a denier for him McIntyre still produces “denialist drivel” – no deletions there. After trying to savage Tamsin Edwards he rows back a long way, receiving a generous “Cheers Mike, I appreciate that” from the young UK academic. The whole afternoon one could see the boundary of the devout and the deniers being redrawn, as the danger of mass public defections became increasingly real. What an example of science at its greatest! It really was that bad a day for the dignity of climate science. Boomerang time.